Military Cemetery/Memorial / Fynwent milwrol: Cairo War Memorial Cemetery, Al Qahirah, Egypt. Died of illness, 3rd September 1918, age 20. Matthew Henry Hughes was the son of John and Mary Ann Hughes, and his birth was registered at Ruthin in the 4th quarter of 1897. In the 1901 census for Wales, available on Ancestry, the family was living at 17, Cement Row, Prestatyn. Head of the family was John Hughes, 40, a platelayer, who had been born at Denbigh. His wife, Mary Ann, also 40, and the eldest son, another John, age 11, had been born at Denbigh, while Matthew Henry, age 3, had been born at Ruthin. Their daughter Annie M, age 6, and son Robert J, three months, had been born at Denbigh. There was a mother’s help, Martha Evans, age 16. The adults and older children all spoke Welsh and English. In 1911, they are found at 17, Albert Terrace, Prestatyn. John is now described as a foreman platelayer, working for a railway company. The younger John, age 21, is an assistant clerk and collector for the UDC, while Matthew Henry, now 13, is a law clerk. Since the last census, the family have been joined by William George, 8, Stanley Aneurin, 6, and Dilys May, age 5. They all spoke both languages. Mary Ann had given birth to 10 children, of whom 7 were living, in 21 years of marriage. Some of Matthew’s service records have survived, although they are damaged, and are available to view on Ancestry. 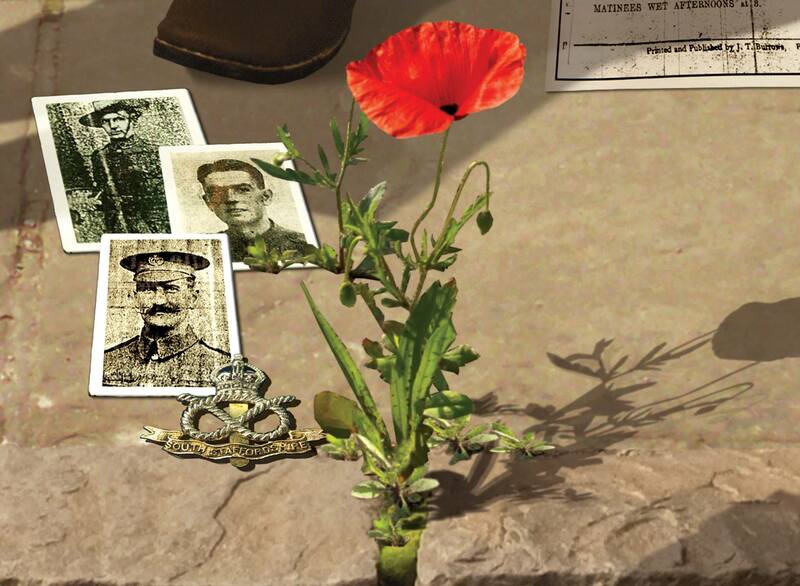 On September 28th1914 Matthew was attested and given the regimental number 2260 in the Royal Welsh Fusiliers. It was a “territorial force attestation.” He was signed up for four years’ service in the 5th battalion, RWF. His medical inspection was at Flint, carried out by Dr Twemlow. His apparent age was 19, his height was 5 ft 5ins, and his chest measurement was 34 inches, 36 inches when expanded. His vision and his physical development were both good. He was passed as fit for territorial service. 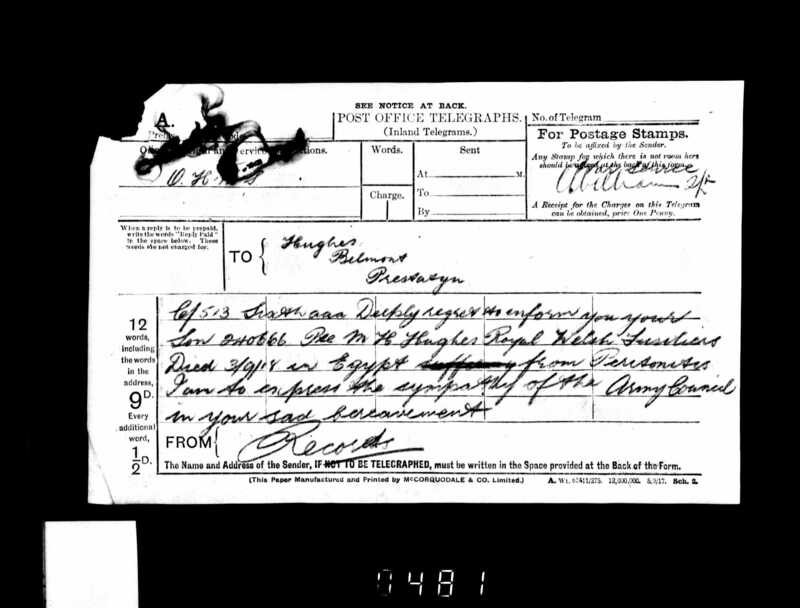 The service records further state that he was attested and embodied on September 28th, 1914. He was posted on September 9th 1915, and again on November 22nd 1915, and again on April 21st 1916. He was appointed lance corporal, unpaid, on November 1st 1916, and then to corporal, paid, on January 25th 1918. He then “reverts to private” on February 2nd 1918. He is posted again on August 2nd 1918. Also in the service records is Matthew’s Military history sheet. He served at home from enlistment until July 13th, 1915. The next day he was transferred to the Mediterranean Expeditionary Force (MEF), until September 8th 1915. He was then on home service until April 24th1916, then with the Egyptian Expeditionary Force (EEF) until his death. The website Soldiers who Died in the Great War confirms the known details, although it gives a different regimental number, and his battalion is listed as 5/6th RWF. Matthew was a prolific letter writer, and it is possible to follow his different postings through excerpts of his letters which were printed in the local press. In the Prestatyn Weekly dated September 18th 1915, it is recorded that Matthew Henry Hughes has been invalided home from the Dardanelles suffering from dysentery, and is in a London hospital. However by October 9th he is home on leave in Prestatyn, and some of his experiences are recounted. After leaving England with 2,000 others on July 12th, he took part in the landing at Suvla Bay in August. Although the landing was not strenuously opposed, they were continually harassed by the big guns of the Turks. His company was under the command of Col. Phillips, and Lieut. Moccatta was also with them. Whilst engaged in dispatch carrying, he came across Privates John Pritchard, T.R. Jones, Stanley House, and R.E. Jones, Jubilee Terrace. He was entertained by them to tea – a luxury he had not tasted for several days. The presence of the snipers is harassing. They are sometimes found behind the British fighting line, and in some cases are women. The weather also is very trying. During the daytime it is fiercely hot, and at night bitterly cold. It is remarkable, says Private Hughes, how soon one gets used to the “zipp” of the bullets and the scram of the shells. After a few days in the trenches the men are indifferent to danger to a degree quite surprising. After several escapes, he himself was wounded in the thigh. He speaks of the Turk as a fighting man with much respect. Private Hughes will leave Prestatyn on Monday, and expects to be sent immediately on active service. He also vows he will never again enter civilian life. Army life is splendid, he says, if one takes kindly to it. Dear Mr Williams, no doubt you will be surprised to hear from the Prestatyn boys. We are the “frivolous five”, viz Jack Pritchard, T.R. Jones, R.E. Jones, Tom Roberts and myself. I am glad to say we are in the best of health, and very keen on seeing the Old Home once again. Oh, for an hour of billiards in the Club! It will be a fine time when we all five get together in Prestatyn, but we must admit we are all happy where we are. People at home think we are having a nice time in the Holy Land, but if it was left to me, I would be in Prestatyn now. I would not care to be in the Turkish army right now, for our gunners are giving Johnny some iron rations. I hear you have had some snow lately, I only wish we could have some, for the heat is terrific during the daytime. Before we went into action, we walked 200 miles, and all in the desert too. I am afraid you will seldom see me on the sands at home once I get there. We do have some green fields now we have entered Palestine, but nothing like the golf links at Prestatyn. Although it was not possible to write about military matters, and Matthew’s letters tended to be upbeat usually, presumably not to worry the family at home, mention of Prestatyn is very frequent. When all these letters were written he was still only in his teenage years. Sadly a telegram arrived at the family home in Prestatyn informing them that Matthew had died in Egypt. Deeply regret to inform you that your son, Private M.H.Hughes 240666 Royal Welsh Fusiliers, Died 3/9/18 in Egypt from peritonitis. I am to express the sympathy of the Army Council in your sad bereavement. A telegram to the Infantry Records in Shrewsbury reporting Matthews death , from Proclicas, which was a War Office telegraphic address from the department dealing with casualties, had referred to him as Sergeant M.H.Hughes. However, other official documents give his rank as Private. From the website Register of Soldier’s Effects, we know that his place of death was Nasrich School Hospital, Cairo. The hospital was given this name as it had formerly been a large school which had been adapted for military hospital use. From this website we know that his father, John Hughes, the sole legatee, received the sum of £7 5s 6d on 31st March 1919, and on 10th November 1919 a war gratuity of £19. On 9th April 1919, Mr Hughes acknowledges the receipt of Matthew’s personal belongings which were photos, a wallet, a wrist watch, a strap, and a badge. Mr Hughes later signs for receipt of his son’s 1914-15 Star, and later for his other medals and scroll. He also completes the army form 5080, which requests the names and ages of all living relatives of the deceased soldier. Thankfully, Matthew’s three brothers and three sisters are all living at the family home. On the website ”The Prestatyn Scala Cinema History Queue Mural”, there are some details about Matthew, and also his picture. The mural celebrates some of the history of Prestatyn and of the Scala cinema, and can be seen in the foyer. Matthew is one of the three soldiers who represent the many from the area who lost their lives in the Great War. A poppy grows out of the pavement in remembrance of all those who lost their lives in the conflict. There is a card for Matthew on the Roll of Honour in the archives at Hawarden. His period of service is given as four years, and his age as twenty. There is a note that he “held the rank of sergeant at death.” It is possible that he was acting as a sergeant, and that he died before the promotion had been passed, as there had been some confusion previously at the time of his death. The card states that he died from peritonitis in hospital in Cairo. Given that Matthew had indeed served for four years, and that he was only twenty when he died, he must have been underage when he enlisted at the outbreak of war. At that early stage, no proof of age, or even of identification had been necessary. He had served his country throughout the war, and sadly died of illness just two months before the Armistice.